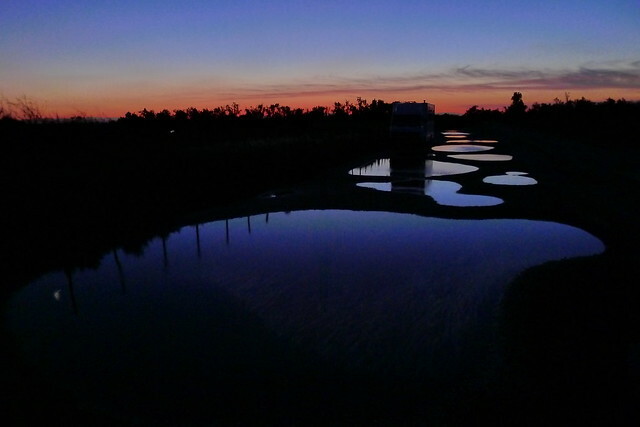 Frank has childhood memories of the Camargue, images of wild white horses, pink flamingos, rice paddies and vast plains of marshland slowly disintegrating into water. So we take a little detour and find a spot by the Etang de Vaccarès just as the sun is setting. I haven’t heard so many different birdcalls all in one place for a long, long time! On a lookout point, we meet a German couple, who are just as open to meet friendly strangers as we are, and we get talking about all sorts of things, while watching the flamingos and other birds. They have a wonderful sense of humour and an appreciation of life – the Germans, that is. It is very inspiring to witness such zest for life from Theresa, despite a debilitating chronic arthritic condition that keeps her wheelchair bound. We share a few songs and stories as the light fades into a spectacular display of colours. Check out photos on flikr for a beautiful sunset! Today is the day we leave Spain… we thought we’d go and see Europe in a year, but have spent most of our time in Portugal and Spain. Even then, we only skirted around the fringe – we still have lots more of Spain and Portugal to discover! And everywhere we make friends, they tell us that any time we want to come back, their doors are open. This way, Europe gets bigger every day, or shall I say deeper. We find a place to stay over night in Montesquieu, a little town of around 1000 inhabitants at the foothills of the Pyrenees. The next morning, when we want to go shopping, we find that all shops have closed down, which means that everyone has to use their car to go down to the big supermarkets 5km down the hill! When we come back to Emma, a man waves us towards him. He has had a severe head injury (one side of his skull is missing), making it difficult for him to speak. But he seems very friendly and wants us to come and see his house. We follow him past a number of cars in various states of repair, into a wild garden with many building projects at varying stages. The house seems to be in need of a lot of TLC too, but he insists on showing us around, and knocking on a chalet in the garden to wake up his brother-in-law. There seems to be a sense of no-man’s land near the border of countries, a place that the world has forgotten. No tourists, very few shops and other infrastructure. I guess when you want to go to a place as a tourist, you want to go to Spain properly, not just across the border from France, and vice versa. And historically, it is the end of the country, so roads peter out, unless they are big roads that cross the border. Of course now all borders are open, but that is rather recent. There is, unfortunately a different kind of ‘tourism’ prevalent though: as we draw near the border, we notice a lot of brothels along the way, and as soon as we cross into France, we see a lot of prostitutes sitting by the side of the road. We stop by a shop to buy some French books and a map of France, to switch our mind into another language – the third one on our journey. It keeps the mind flexible! 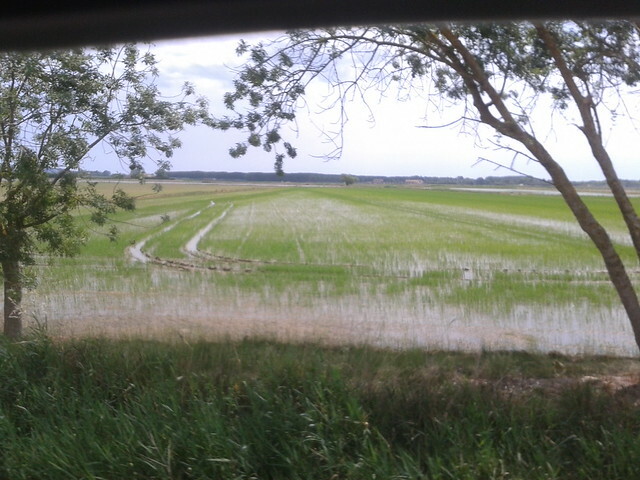 As we drive eastwards, we come across the first rice paddies. We are quite eager to get away from the big city and back to nature, so after waving good-bye to Dan, we return to Emma and leave Barcelona going up north-east, ducking out under a large black cloud that threatens to come down on the city in a heavy thunderstorm. We find a place by the sea, a beautiful little cove called Platja de Castell, down a forgotten path. On a large car park, we only have one neighbour, a vivacious Australian woman called Gemma, a seasoned traveller who is in love with China and shows us some beautiful jewellery she has brought over from there… I can’t resist a well-crafted pair of ear rings! The sea is gloriously clean and calm, so we go for a swim in the setting sun. Walking back up from the beach, we stop to listen to the nightingales. They are projectile ventriloquists – able to choose their singing spots to make their song resonate in such a way that you cannot place where it comes from. It is notoriously difficult to actually see a nightingale. That night, proper rain catches up with us too, drumming on the roof and washing off all the city dirt. The next morning, we set off early so as to avoid being caught on a narrow road in the steady counterflow of day visitors to the beach. We set on our travels with the intention of finding a quiet place, somewhere near the sea, where we are welcome and where there is a space to practice dancing. Places that have been recommended to us turn out to be far too touristic for our liking, with car parks charging by the minute and hordes of foreigners flooding large supermarkets. 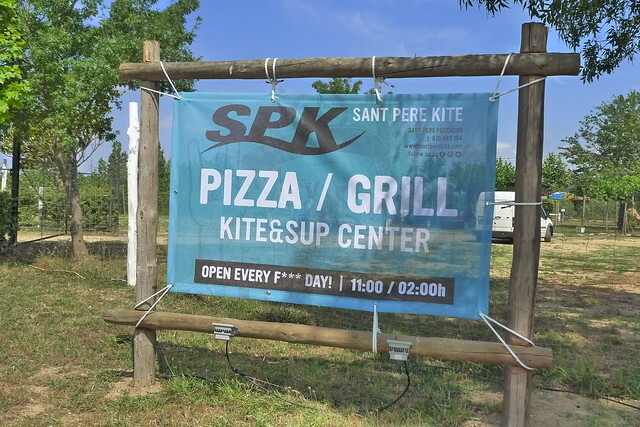 Just as we are about to give up and turn inland, we get ‘lost’ down a little road that takes us past Sant Pere Kites, a restaurant and surf/paddle school about 3 minutes bike ride from the beach. What catches my attention is actually a newly built skateboard half-pipe that looks like a perfect place to practice Tango on! We stop and reverse into their parking lot. 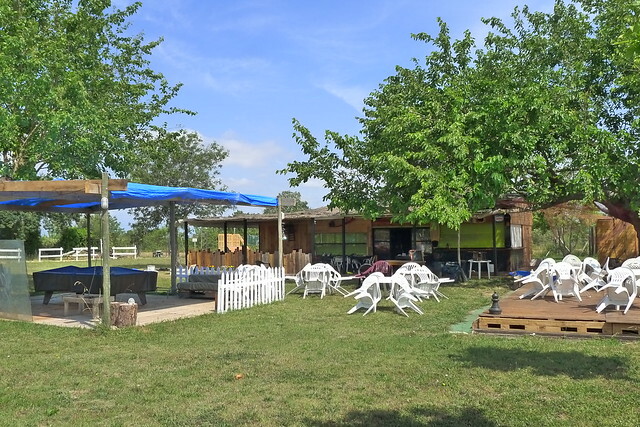 We meet Dani and Anna, the proprietors, and Pau and various other workers, all busy to get the place ready for the season. Dani is happy for us to practice Tango, and not only that, but welcomes us to stay the night. This is the perfect place for us, and we end up staying a few days. We can sleep in the van with the doors open at night, we practice Tango every morning and I get time to put several hours of bandoneon practice in while Frank lends a hand with the work that needs to be done in time for the ‘grand opening’. In the mornings and evenings, we hop on our bikes to go down to the beach for a swim. There are quite a number of tourists around here too, but as the beach is huge, they are quite spread out and all seems very chilled. At night, we are usually the only ones there – a good opportunity to skinny-dip! 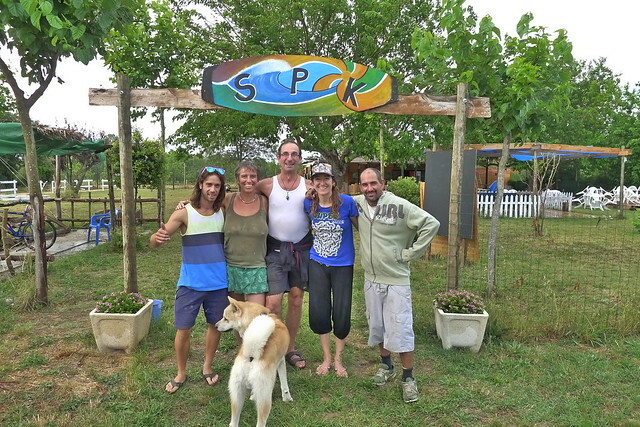 The crew at Sant Pere Kite is super friendly to us, and we admire their hard work to transform the place. It’s a real boy-zone, with possibilities for play everywhere: a pool table, a halfpipe to practice your skating skills (or your Tango J), a bike stand, a wooden platform for a boogie, a chillout corner with a sound system, and the restaurant has a wood-fired pizza oven. The publicity says they are ‘Open every f*** day from 11am – 2am’ – slightly shocking advertising to our ears, but I guess aimed at the young surfing crowd. As we are about to leave, we also meet the owner of this little piece of land, an Englishman called Mike. We share a meal and some travelling stories… he’s just driven all the way to and from Venice, a 3000 km round trip, to help someone move their furniture! 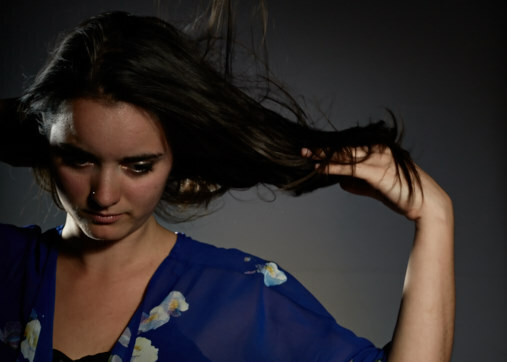 Lilli’s performance was really moving – she had most of us crying with the sadness of the songs…. every time I hear her, she has developed her voice and she sings more fully, richer, more dynamic than before. Such a pleasure to see our respective children do well and be happy. We make use of being in a city where one can dance Tango every night of the week. It is lovely to meet up again with Osvaldo and Graciela, who are often guests at Fernando’s Tango Feast in Devon, though Frank had met them some years earlier at a Tango festival in Barcelona whilst making a TV programme ‘Dancing with Colin’ (Jackson). They have since moved to a new venue, beautifully decorated, and the atmosphere of their Milonga ‘La Yumba’ is very friendly. On Sunday afternoon, we take the metro to go and dance Tango in the open air in one of the parks in Barcelona, Parc Ciutadella. We meet up with Chechu who lives right by the side of the park and spend an afternoon chatting and catching up. She hasn’t been that involved in Tango for the past few years, giving herself time instead to follow The Artist’s Way and training in NLP, as well as devising her own programme of teaching how to release creative energy, called ‘EncaminArte’. We also go to dance with a younger crowd in El Susurro, as part of the Tango Marathon which takes place one weekend, but I find this group not so open, and there is a more predatory feeling around who is dancing with who – one of the aspects that I don’t like in Tango. One night, I meet up with Jim at Milonga Queer, a relatively new Milonga. Unfortunately that evening, there is one couple who need to show off their high boleos to the crowd, and since it’s quite a small dance floor, they make dancing for everyone else rather difficult, so I leave after a couple of hours. Josep and Teresa have moved to a different venue since I last danced in Barcelona, but the atmosphere in their Milonga is unchanged – very warm and friendly, traditional, close embrace Tango, an older crowd. I have always enjoyed coming to their Milonga, it is unpretentious and from the heart, and I enjoy Josep’s choice of music. There is a great map of Tango in Barcelona, ‘Ruta del Tango’ which locates almost all of these Milongas plus many more that we didn’t have time to go to. I’d say Barcelona is a good place to go and immerse oneself in dancing. The atmosphere is very friendly, although on the whole I missed dancing of a more subtle and musical nature. But this has been the case throughout our journey through Spain and Portugal, not just in Barcelona. We’ve been worried for a while about where to park in Barcelona. We would like to spend quite a bit of time there, to see old friends, to go dancing and then for Frank to stay on and be visited by his son Dan while I go off to London to visit my daughter Lilli. It turns out we needn’t have worried – as we are driving around Montjuic (a steep hill near the centre of Barcelona, where a lot of the Olympic buildings are) in search of a water pump, we meet a guy on a skate board who then escorts us, on his skate board, to a lovely car park with a water pump, overlooking the city. We have a few travelling neighbours, although they are less obviously living in their vehicles, which look more like removal trucks than campervans. For a few days we have found our perfect home – near the centre, yet outside of it, up in the fresh air, surrounded by trees and grass. The water is of good quality for drinking and we hold our head under it too, to freshen up in the heat of the day. We explore the city on bicycles. The Rambla is flooded with tourists, and I’m missing all the street performers that used to be there – living statues, painters, dancers etc. There’s nothing anymore, except a few musicians on the metro in officially designated spaces. We discover a music shop of the old style, the Casa Beethoven. One of the last of its kind – you can ask for any obscure sheet music (such as a bandoneon study book), and they guy who runs the shop will know what you are talking about, whether he’s got it, or anything similar, and where it is stacked on his many shelves. Montjuic has its own atmosphere and places of attraction. 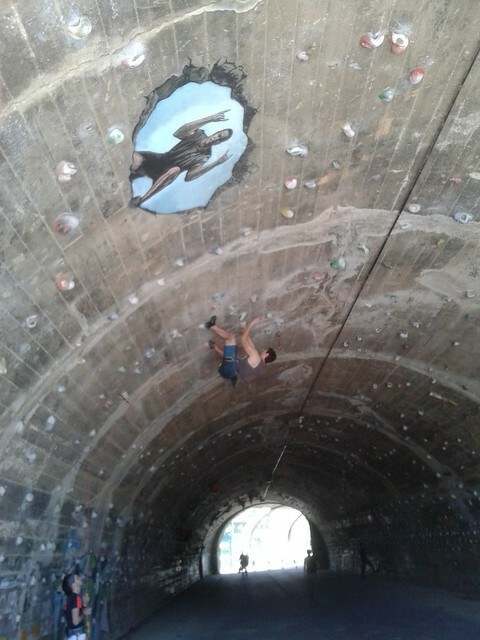 Near where we are parked is a tunnel that is used by climbers, almost 24/7! They’re a really nice crowd, relaxed, friendly and quiet. One day, we meet with Maya and her daughter to spend the day playing in a park near the funicular, dancing around the pond, playing sleeping beauty and looking for frogs amongst the Lilypads. Another day, Jim comes up to Montjuic to meet us and we spend a few hours walking around, ending up in the cemetery that overlooks the industrial port. 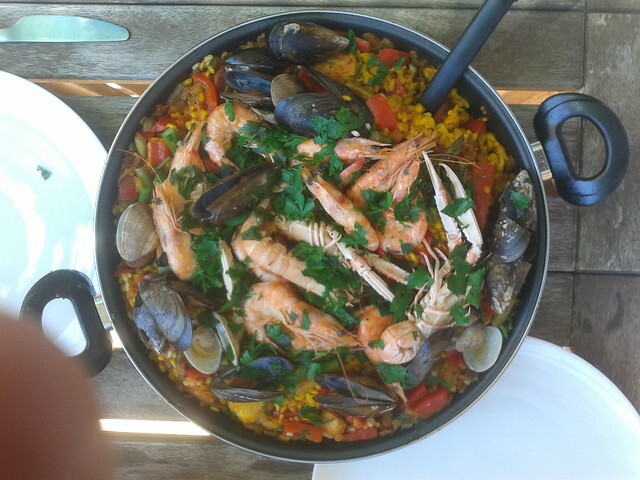 Jim is a great raconteur and Frank a great cook, so we share food and many a good story. Being in the city presents its own challenges. Within the space of the last four days, we got robbed, with Frank’s purse and bank cards being stolen and an attempt being made at getting money from his account (we were pick-pocketed a second time too, but we were wise to it and had nothing but tissues in the pocket that was fleeced), my computer broke down for the second time and we had a note from the police, demanding us to move on, plus a fine may be waiting for us upon our return to the UK. I guess we try and make the best of all experiences. With regards to being robbed, Maya says you haven’t been to Barcelona if you haven’t been robbed – it happens to tourists and locals alike. We are lucky that we almost instantly discovered it and managed to cancel the cards before further damage was done. Being moved on by the police is a bummer – we had found a really lovely place in Montjuic, away from the hustle and bustle of the city but within walking distance of the centre. Now we have to start searching again – and it’s not easy to find something. In fact it is forbidden to park with a campervan in the whole of the city, except for in designated spaces and they cost a minimum 30 Euros per night! After a few days of struggling with the computer, this morning we managed to get it going again, once more with the hard disk removed and connected from the outside. It feels like it’s had a heart bypass (for the second time), but at least it’s working! The biggest challenge for me is to learn to let go of needless worry about loved ones, to send strong loving energy instead and to trust that all will be as well as it can be for them. Out of sight does not mean out of mind; we participate emotionally in the lives of those close to us to the same extent as if we were at home – or possibly more, the mind being free to roam more than if it was preoccupied by a daily job. Driving Emma around a busy city with narrow streets can be quite scary sometimes. Our attempt to leave Barcelona by the back door is quite an adventure: We get lost in miles and miles of suburbia (or did we drive around in circles?) until at last, we end up in the national park behind Tibidabo, about 20km outside of Barcelona. We draw up by an old church and cemetery and spend the following day resting from the hustle and bustle of the city, catching up on the internet and eating the mulberries that drip from the trees under which we are parked. We return to Barcelona via a little windy road that comes out at Tibidabo. 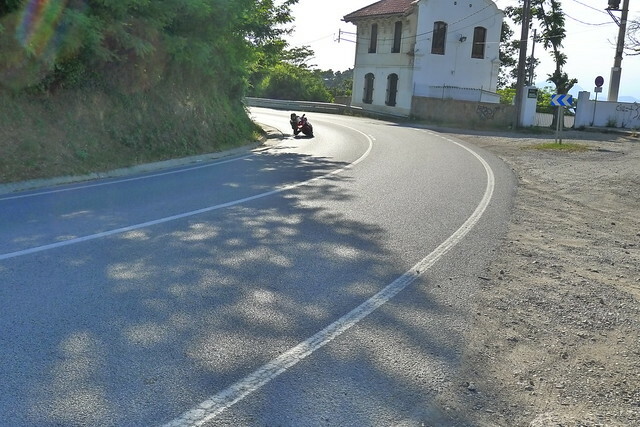 it was quite scary to see how hordes of motorcyclists used it as a race track! The following day, we spend another hour or two driving around the outskirts of BCN, trying to find a suitable place to park for the night. This time, we find a very rich part of the city, with leafy, quiet streets. We find out the next morning that we are parked up next to a large cosmetic surgery clinic! 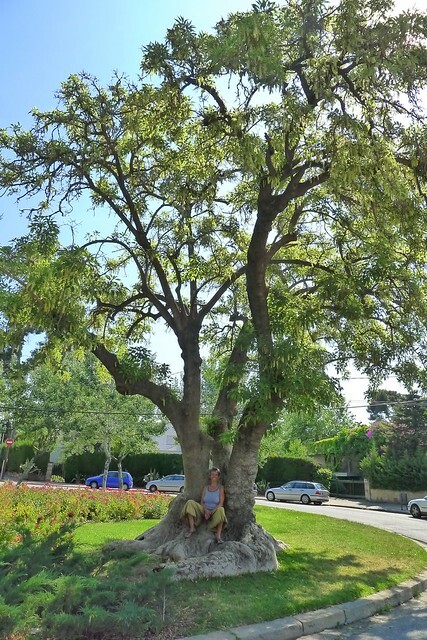 There is a beautiful old tree on one of the roundabouts. Perfect place to sit and contemplate! Wherever you stay in Barcelona, you will never be far away from a rubbish container, which means you will be woken at 3am by the collecting lorry. But this night takes the biscuit, as they decide to have their fag break right outside our van, leaving the flashing lights and the motor going for 15 minutes! You’d think it’s not such a big deal to be woken at night, but if it keeps happening, it does sap your energy. The following day, we make another attempt at finding a place. We are drawn to go back into the area near Montjuic, as we liked the Mercado de la Marina and its surrounding neighbourhood. 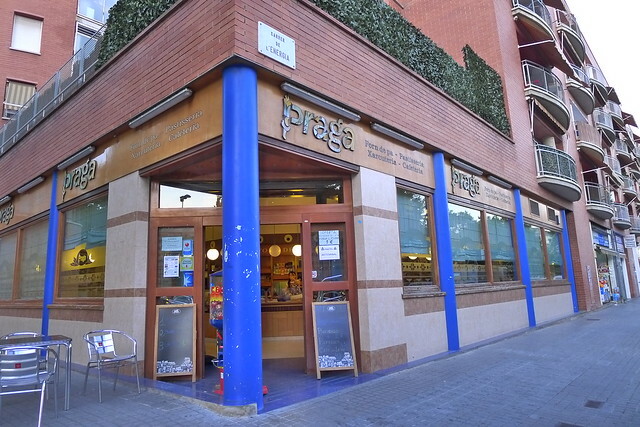 We find a wide, shady street where we can park, just opposite Café Praga, run by a very friendly Chinese couple who tell us we can use their internet from our van after opening hours! I decide not to be so intimidated by the city vibe, and I open our door to the pavement, just like I would do in a little town or village. We greet everyone who passes by and make conversation. Instantly, the feeling changes, and we find out that this neighbourhood is indeed like a little village where people know each other. We have an animated conversation about local politics with an older woman who pushes a zimmer-frame with her little dog sitting in a basket in the top. It is lovely to find people who are friendly beyond a surface reaction, like the Chinese couple from the Café, or the woman with her dog. It is interesting how our status changes depending on what people see of us. Our identity seems to be quite fluid. If we are just in the van with the door open, people will speak to us and enquire about our honeymoon, or be curious to see the inside of the vehicle. If on the other hand, we are having a meal, they tend to hasten by, not even returning a friendly hello. If we wash our clothes at the nearby pump, we sink down into another level of society entirely, and people will start to regard us with distrust. 30 inhabitants live in houses built with great big stones the colour of the rock on which they stand. One of the cafés is perched precipitously on a ledge. The views are stunning – it must be climber’s paradise here! We spend a couple of nights parked up just above the village where we can feel an incredible energy flowing through the van, not unlike when we were parked up by the Buddhist centre in the Alpujarras. Only this one seems more expansive while the previous one felt like being in a river. We go for walks during the day –everything is steep up of down, climbing over rocks both ways. 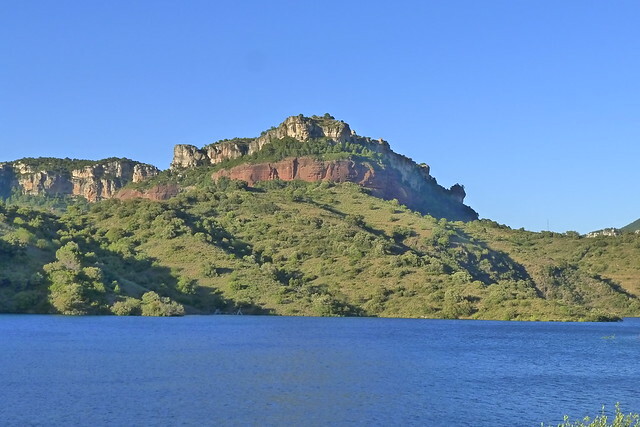 Two further nights are spent by the lake just below Siurana, soaking up the sun and silence (we are almost totally alone there) and going swimming in the clear and cold lake. In terms of landscape, Siurana was one of the highlights of our journey so far! For photos, go to Flikr – there’s one of me sitting on a precipice… as part of my practice of doing something scary each day.